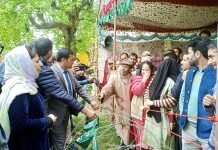 BANDIPORA, Sept 12: District Development Commissioner Dr Shahid Iqbal Choudhary inspected the arrangements made and amenities provided at various Imambaras at Shadipura, Sumbal and adjoining areas for Muharram. District Administration has equipped 58 Imambaras for uninterrupted power and water supply apart from construction of Sanitary Complexes, installation of LED lights and provision of basic needs. Each Imambara has been provided with twin-batter Inverter for power back up of 12 hours, two PVC water tanks of 1000 litre capacity each, LED lights and sanitary complexes. Permanent infrastructure has been provided to Imambaras for the first time. 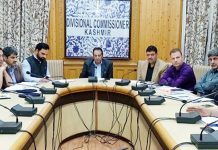 The DDC inspected amenities provided and upgradation of infrastructure for Muharram arrangements for which liberal funding has been done by the district administration. 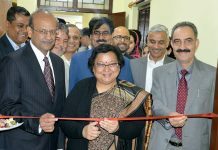 A record number of 58 Imambaras have been provided Inverters at a cost of Rs 32 Lakh whiles as Rs 30 Lakh provided to power department for installation of LED lights, thimbles, LED lamps, PVC wires, creation of 2 new Sub-Stations of 100KVA in Shia-dominated areas, 100 poles for distribution network and allied material. Tankers have been pressed into action for dedicated water supply. An investment of Rs 7 Lakh has also been made for laying and shifting of pipes. Municipal Committee was provided Rs 3.50 Lakh for sanitations. Meanwhile, work has started on 40 Community Sanitary Complexes to be constructed at a cost of Rs 80 Lakh. The DDC also agreed to the demand for more CSCs. In view of Muharram processions various roads have been upgraded. 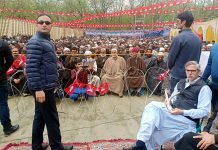 An amount of Rs 27.50 Lakh has been incurred through PWD for upgradation and blacktopping of various roads in Shadipora, Dangarpora, Trigam, Gundkhalil, Malaoipora, Inderkoot, Nowgam, Murtazabad, Gonsipora, Jaffri Mohalla, Najin and Tulerzoo. Sufficient quantity of firewood and rations has also been made available. The DDC along with SE PDD, ExEn PDD, ExEn PHE, ExEn PWD, Nodal Officer DMO, Tehsildar and other officers visited various Imambaras to review the status of installation of equipment and development of infrastructure.